They’re available for download. If players do not have the map, it will certainly be available to download in-game, but it should also be available from our download source as well as various other places on the Internet. They’ve been play-tested. Seems an obvious point, but subjecting a new unknown to a group of people that flounder is the best way to improve gameplay, right? Wrong. For every new map that’s added to the server, there must be at least one person who has play-tested it. Mapraider – some nice screenshots and reviews, but the download links are slightly convoluted. Some maps have already been added to our download area, but not all will be provisioned for server playing. Note that any provisioned map will be in the download area, but many in the download area may not yet been provisioned… so feel free to try a few out for yourself and provide a review – give us a reason to provision them! 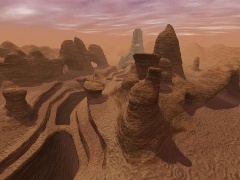 Large canyon with several nodes, featuring accelerator rings for speedups. The open-plan aspect means lots of long-distance shelling and dodging potential. Just watch you don’t fall! 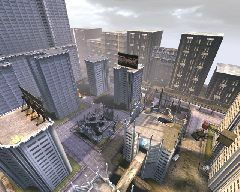 Damaged buildings obscure some views, requiring careful navigation when doing Raptor runs. Beautiful mix of open countryside with hills and valleys, great for Manta skimming and Scorpion leaps. The default links permit two routes through the nodes, so there’s no single contended point.